I originally thought to tell the story of when I backpacked throughout Europe in the late nineties with just a friend and a smile. I assure you I had many cross-cultural experiences, some of which I still tell to this day, twenty years later. However, I want to tell you a situation that really changed the course of how I see people, from the viewpoint of the color of their skin. We Know You Didn’t Mean To Kill Our Cat! It was an accident. 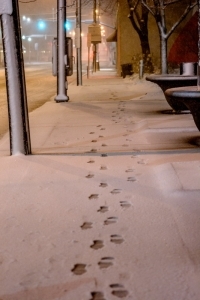 You were driving down Lake Avenue on Thursday evening, January 12th, at about 6:30 or 7:00 p.m. That’s when Snowball ran out into the street and was struck by your car. Needless to say, he is dead. We know you didn’t mean to hit him. It was probably unavoidable. It just happened. In the tradition of American ghost hunting an apparent tie exists between the civil war and the nation’s most notorious hauntings. Southern places and southern-born writers seem to dominate the scene. Adam Keith comes from this rich history with his birthplace, Louisville, Kentucky situated squarely within its geographic and cultural boundaries. A hobby ghost hunter himself, Keith moved to Lakewood late last year, doing his part to build the pantheon of unique, venerable personalities that give the 'Wood' its distinctive character. Keith is an introverted man with a gentle, soft-spoken sensibility. His care-free gate and penchant for filtered cigars are characteristically southern. As an ambassador of his birthplace, Keith embodies that famously southern hospitality. It’s not surprising that, given his introversion, he has yet to explore Lakewood beyond the Madison and Detroit Avenue business districts. However, as an observant southern man, he’s keenly aware of the personality distinctions between the two districts. According to Keith, “People are friendlier on Detroit, they say ‘hi’ and smile… not so much on Madison.” Though however friendly Lakewoodites on the Detroit ley line may strike him, in this regard the northern cities do not come close to those of the south, that place that beckons his heart’s return. From Marc’s to Drugmart, Family Dollar to Dollar Tree, budget class shopping accounts for the largest share of mid-sized national retail in the ‘Wood. As one laissez faire indicator of underlying economic conditions, the proliferation of these outlets within the ‘Wood speaks to our natural market state. What's the middle-class Lakewood kid to do with his energy and time? Either it's wallow alone in the muddle. Or it's call a S.W.A.T. team huddle. The Lakewood kids huddled in the thick of the swarming mob gathered around Kaufman Park have answered that question. When seeing the swarming kids from afar, it is difficult to realize that within the swarm there really is a Lakewood S.W.A.T. team ramping up a rough and tumble positive identification of youth with the good of the city. They are doing so on their own creative, energetic and unsanctioned DIY terms, of course, the way youth has been doing it for ages. Sure, there will be bumps along the way, but let's probe for positive potentials. Volume 1, Issue 9, Posted 09.29 AM / 16th November 2005. Some people believed in his snake-oil cures for the ills of a struggling public institution. Few took the time to examine his charter school mythology in a critical light. It seemed cool, counter-cultural, esoteric and wildly anarchic. Behind the charter school mythology was the pagan friar named Brother Petty. Now he is known by the Lakewood and Rocky River Police Departments as Philip J. DiStasio. Volume 1, Issue 6, Posted 04.13 AM / 09th September 2005. The Ohio Senate recently passed SB 82, stripping municipalities of the right to impose residency requirements on city employees. SB 82 opens the way for the coronation of "The Have It Your Way - Burger King Public Servants," who will rule from exurban castles that sprawl across the region. Volume 1, Issue 5, Posted 11.11 AM / 23rd August 2005. Lakewood's walking man; Vernon Bognar is a living legend. Barely a year old in 1914 when his family relocated from Cleveland's Westside to Olivewood Ave in Lakewood, Bognar has watched nearly a century pass. Except for time spent in military service he has lived his entire life in Lakewood. Doing his best to show respect for the city he describes lovingly as "the most densely populated living quarters from New York City to Chicago," he can be seen daily, walking and collecting refuse along Madison and Detroit Avenues. Volume 1, Issue 4, Posted 09.55 AM / 27th September 2005. Superintendent Dr. David Estrop remembers a time when public schools across the nation upheld strict uniform policies and separated students by gender for certain courses. Volume 1, Issue 3, Posted 10.00 AM / 27th September 2005. This summer Lakewoodites walking, biking and hanging out on our city streets should take notice. 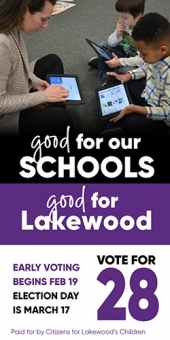 The Lakewood Observer is listening to the community voice at ground level. We're patrolling the streets of Lakewood to capture the pulse of our community. Volume 1, Issue 2, Posted 05.10 PM / 19th July 2005. The dust seems to have settled. Political fallout from the defeat of Issue 47, the West End Development Project, has resulted in a shift of office holders, one that did not exactly elect a unified platform on the issue of development, however much that development seemed a key friction point leading to a populist-style victory for several candidates. What has changed significantly in the months following 47's defeat has been the level of conscious citizen participation in civic life. In this regard Issue 47 can be conceptualized, in essence, as the "crack that let the light in." The community was polarized along two lines, either for or against the project. The need to preserve and save our city in these tough times of changing life conditions was not the polarizing issue. Rather, the most effective way of getting there became the trigger point dividing the city. Each side was convinced that they knew what was best for the city. Volume 1, Issue 1, Posted 04.31 AM / 24th June 2005.